Teaches you how to control your buoyancy resulting in a more streamlined profile that reduces drag while making finning and moving through the water easier and more efficient, therefore improving your air consumption. 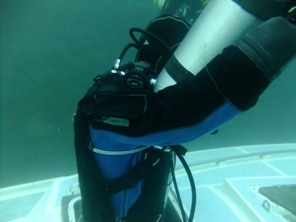 Attain a greater comfort level as sidemount equipment and harness can be custom fit to each individual, accommodating divers of all shapes and sizes. 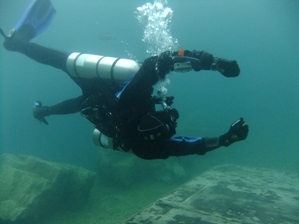 Learn how to take advantage of many skills including learning how to help any divers with any disabilities, as you carry the cylinder(s) separate from your harness to the water. Whilst within the water you would then attach your cylinders, making the entries and exits to dive sites much easier. Learn safer options in terms of air management as you have an easier access to your cylinder valves, first stages and alternate regulator should a problem arise. How to configure equipment learning that one harness and BCD does it all. The same sidemount equipment you use, can be used for more advanced types of diving i.e wreck, technical and cave diving. All Sidemount kit would be provided for the course if you don’t have your own. Various entry techniques with/without cylinders. 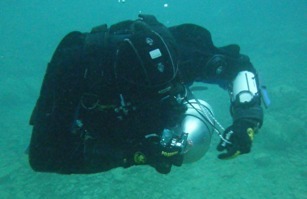 Don and doff the sidemount cylinders whilst in the water. S drills and bubble checks. 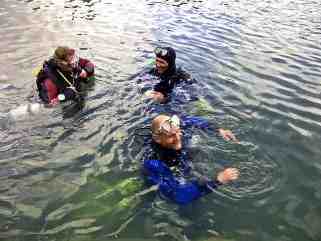 Neutral buoyancy swimming using various finning techniques and turns. Single and twin partial cylinder removal and swim neutrally buoyant. Neutral swim with a single cylinder. Simulate a regulator free flow and efficiently breathe from regulator using valve fluttering. The course is conducted over one full day of theory, workshop practise and dry skills in the classroom. This course can be taken in conjunction with a RAID Open Water 20 course, or taken as a speciality course and need to have a RAID Open Water certification or equivalent from another agency. A lot of divers use this as an intermediate step into learning wreck penetration. places you have only read and dreamed about. What about diving deeper or for longer? You already have a safe redundant gas supply, this is perfect for the Deco 40 course. Staging cylinders is an art, one that requires proper training too, if you want all your cylinders to look perfectly streamlined.